wish we had thought of that before we started!!!! My cleaning fairies left years ago and I tried to get my kids to take their place. As every parent knows, that didn't go well at all! Your lights have to be amazing and you get to enjoy them in peace and quiet after everyone goes home! OMG! I have never seen anything so cute and funny as the tea robot!! How do we survive the holidays with family--tea robots, of course. Tell Phantom she should brim the hat so you can take a picture and sketch it. Will be waterproof so she can wear it in the pool! ;) Happy weekend!! So cute! And I love how you created the perfect color for the tea. damn, that's one cute tea robot, my dear! I'll cross my fingers that he helps you survive the holidays. Hope you find time to enjoy those awesome sounding fairy lights! 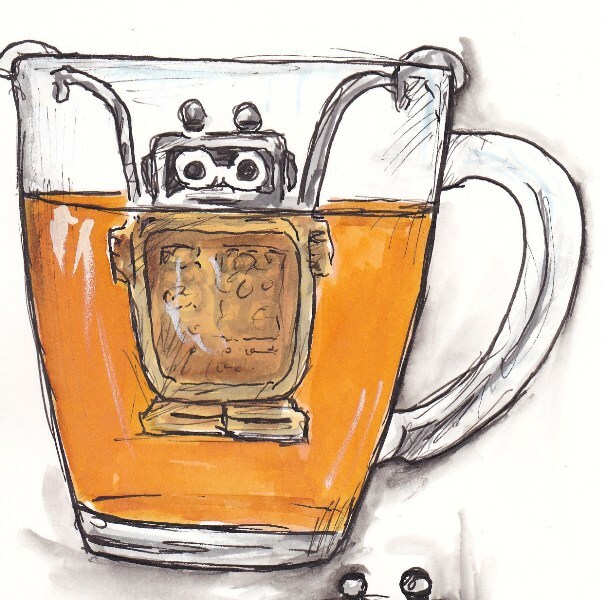 Thats what I need a tea robot, re3ally cute love your drawing. Hope you survive the madness of the buildup to Xmas. 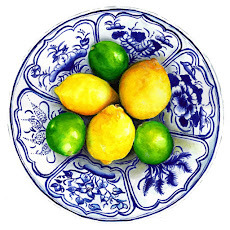 Sounds like you need something stronger than a cup of mango tea! Wow! Thatäs the cutest- coolest darn robot Iäve ever seen. Maybe you should employ hin instead of the fairies. Mine have taken leave as well without permission. Have to have a word. Where do you find all these CRAZY gadgets?? I'd be scared witless if someone handed me a cuppa with a robot in it - scared that the person serving it to me was in fact a total fruit and nut! lol! My cleaning fairies gave up on me YEARS ago and I have resigned myself to the fact that cleaning is just not one of my talents. In fact, I think the only fairies around my house are the UNcleaning ones! I LOVE your robot- he is amazing! You have me racking my brain trying to think of tea drinkers that I should get one for! My Dad's girlfriend would prolly like one, but every time I get her a present, my Dad thinks I'm getting too attached and breaks up with her. Seriously- he's done this 3 times! Thanks for always writing the most amazingly funny posts and always having great art to go with! Thanks also for my Christmas card- it made my week! Your robot is fabulous! And Ill bet the lights are too, like Carolyn said, you get to turn them on and enjoy them after the guests leave, with a nice cup of tea made by your robot. We started taking a vacation this time of year and skipping the holiday, you can't believe the difference it makes in the quality of life. I just love the tea robot and think the world's cleaning fairies must be having a big party somewhere or are on strike. Mine have been gone for a long time and won't even come back to help me while this drafted arm fracture is healing. I am in love with your little tea bot! I have a thing for cute retro looking robots. DH walked in the room and saw your fantastic sketch and said, "Hmm, someone just like you." I think the word "weird" might have been in there too, but we can ignore that. 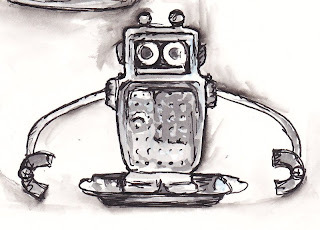 If you have any idea where I could get my own tea robot, please leave a comment on my blog or send me an email. I'll love you forever! PS: I don't know where your cleaning fairies went, but they sure didn't come here. First off, that tea robot is just cool! I want one! Second, the stories of your craziness are so much fun. A duct tape hat! Sounds like something my crazy son would cook up. I hope it gets finished. 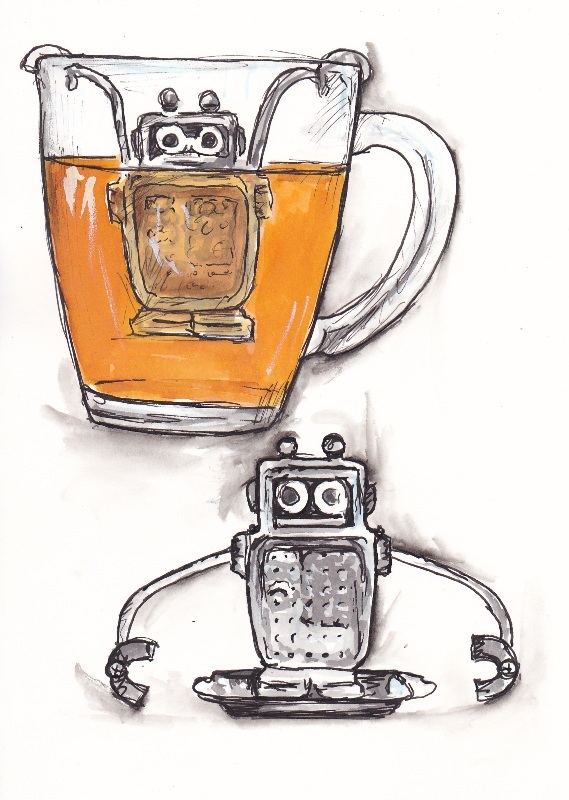 I love your painting this week - that robot is a great subject and perfect in a glass mug to show him off! I wonder how he would do with some Hot Cinnamon Spice tea? Happy PPF! That little robot infuser is hysterical! Where did you find him?!? I can't wait to see the painting of the duct tape hat! Hi Tracey. Love your colors and work. Awesome. Just popped in to say Happy Holidays and will see you in 2013. Thanks for popping in to my ppf's. Took me a while to work out the function of the tea robot (other than as a cute model for drawing) -slow brain syndrome. Clearly he's an infuser. Great picture and post. I think you should sketch the duct tape hat, perhaps without and with real head in it. Have a great Christmas, good wishes to you and yours. Your tea-robot is the cutest! 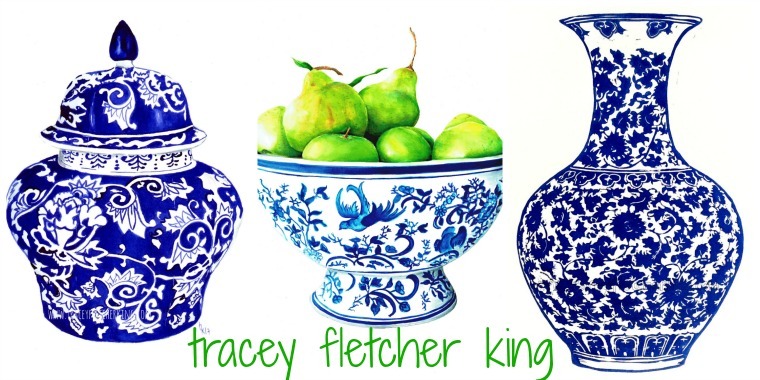 oh my goodness Tracey!!! that is the coolest gadget ever!!! wow!!! and your sketches are amazing as always!! you are on a roll girl!!! That has to be one of the best items ever invented!! I need one bad! I LOVE your illustrations of Mr. Robot...just wonderful!! Happy PPF! oh how funny and how true this post is! 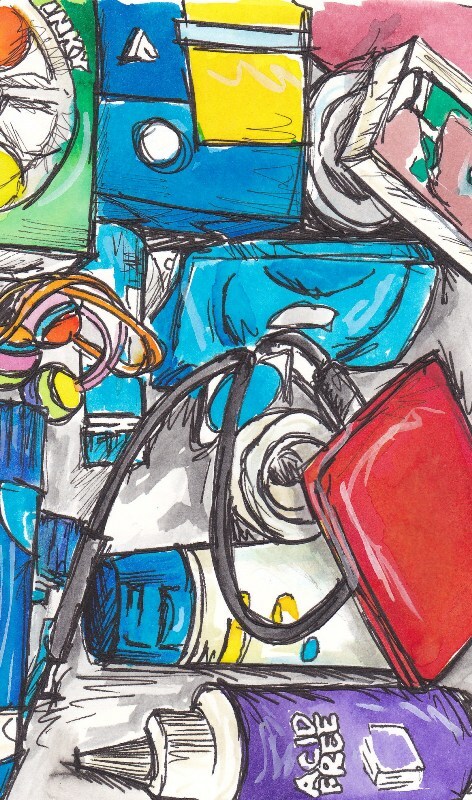 !Love your illustrations and 'specially your robot! Happy PPF! Would love to see the dining room lights! And phantoms hat! :-) Hey, The tea robot's a cutie! Like the tea robot - fairy lights sound wonderful - worth drawing the curtains and dining in fairy lights for even it is lunchtime! Where did you get that cute tea robot? He's so darned cute! I can see why he'd bring a smile to your face amongst the chaos of the season. The fairy light ceiling sounds lovely. I desperately try to avoid shopping centres at this time of year. CRAZY!!! I'm relieved I do my grocery shopping online now. Where did you get that Krazy tea toting robot!? So cute. I wish you luck with your chores! I spent 3 hours trying to find out why one section of my lights on the tree won't light. I used all the testing methods except pulling out every bulb and testing them. I spent another 2 hours running around to Home Depot, JoAnn Fabrics, Wal-Mart, Target and Radio Shack to find an old fashioned bulb tester because those new fancy "gun" testers have an area to test bulbs, but the pre-lit tree bulbs have a much wider base, so they don't fit the bulb tester on the "gun". That is why I just left the burnt out area at the bottom of the tree, burned out! I also had to put another electric cord outside because I had already replaced three fuses. It would light for about an hour then blow out. So I found the area with a burned out bulb and replaced it. The minute I replaced it, it blew out a 2-foot section. I changed the fuses on that plug and tried another new bulb in that socket and it blew it again! So I also have an unlighted area along my fence. I'm disgusted! Then it took me another 45 minutes to get the tree put together. I am just starting to put ornaments on now! I hope to finish tonight. Tomorrow morning I have to get this house cleaned up! I have dishes to do, laundry to fold, vacuuming!!! Present wrapping, and card writing before my artist friends get here at 2PM! What does the robot do in your tea? Makes me curious and smile too! Love your painting! Don't forget to rest and relax! Your cute looking robot is truly an angel...Why does every lady,in whichever part of the world she may be,has always some problem with the cleaning fairies ?? omg I lovelovelove your tea robot. Where on earth did you get that thing? And the story about your new alarmclock is hysterical. That dog is so cute (although I'd like to throttle hm as well I think, if I were in your position ☺) Love your drawing of the duck! Loving this post and your art. I didn't realize that your tea fairy robot was real until the end. Where did she come from?? sadly, we have dust bunny fairies who have taken over my house. I try to look at them kindly...Happy Belated PPF! Well, If your Robot needs a Christmas Cleaning! You can send him to me in Lynn, MA and I will Return Him in time to set up Christmas, 2013. He will be shining like He had never seen Mango Tea. I promise. I have the secret. I will show you. We have two Presses, ONE is for Coffee Only, The other for Tea only! Both the inexpensive ones from Starbucks. As for the cieling lights: Pull the shades down and light them up for lunch. Maybe with some candles on the table - the do come in the battery style - no life fire. after banging my head several times I stopped trying to stand up straight. D'Oh! I can relate to the mild panic that seems to be inevitable this time of year! Your fairy lights sound cool!!!! Good luck keeping (?) sane!!!! LOVE that tea robot!! So cool! Funny little robot - not being a tea drinker, I've never seen such a thing. Nice of him to help out though. Luckily all my holiday stuff is done - cleaning, check; cooking for party, check; gifts wrapped, check; gifts to post office, check. So now I can sit back and gloat as you other less organized, less fortunate ones fuss about! :) Your twinkle lights sound like an amazing amount of work, but I bet the result is fab - I'd have them on all the time regardless of whether people were coming over or not. I keep forgetting it's summer for you and you're having bright sunny days - here it's gray, gray and dim, dim, so twinkle lights would definitely be welcome! Your post is too funny, your illustrations are amazing and I can't believe the tea robot is real! I want one!! Happy PPF! I have never seen anything like this. Adorable. I followed a link on Dion Dior's blog, and am I ever glad I did! I love this lil guy. I'm a bit of a science fiction nut, so he's just the cutest thing ever! You have a wonderful wit, and have brightened this gray Canadian day for me.